NETWORK FINALS: After football adjustment, 60 MINUTES dropped 0.4 and GOD FRIENDED ME was down 0.1. On FOX, THE SIMPSONS lost 0.1 and FAMILY GUY gained the same. SUNDAY NIGHT FOOTBALL adjusted to 6.5, down 0.9 from last week’s final. CABLE HIGHLIGHTS: The new home base for the PEOPLE’S CHOICE AWARDS is E!, where it was at 0.23, with simulcasts at 0.16 on Bravo, 0.13 on USA, 0.07 on Syfy and zero/17K on Universo. AMC’s THE WALKING DEAD dipped 0.05 from last week’s big episode to 2.02, and TALKING DEAD fell a more substantial 0.27 to 0.73, with the late-night HISTORY OF HORROR up 0.02 to 0.16. Hallmark’s movie CHRISTMAS IN LOVE was at 0.62. Nickelodeon’s 11AM SPONGEBOB rose 0.07 to 0.36. Adult Swim’s DREAM CORP LLC was at 0.34/0.30, compared to last week’s 0.28/0.23. On HBO, LAST WEEK TONIGHT gained 0.04 to 0.24, CAMPING shed 0.02 to 0.05, and the series premiere of SALLY4EVER was at 0.03/165K. The series finale of TNT’s THE LAST SHIP ticked down to 0.19. The season finale of Lifetime’s YOU rose 0.04 to 0.18. BBCAmerica’s DOCTOR WHO lost 0.02 to 0.18. On Showtime, RAY DONOVAN grew by 0.05 to 0.18, THE CIRCUS dropped 0.02 to 0.05, and the season finale of KIDDING ticked up to 0.04/224K. Starz’s OUTLANDER fell 0.08 to 0.13. Bravo’s REAL HOUSEWIVES OF ATLANTA led unscripted, ticking up to 0.74. 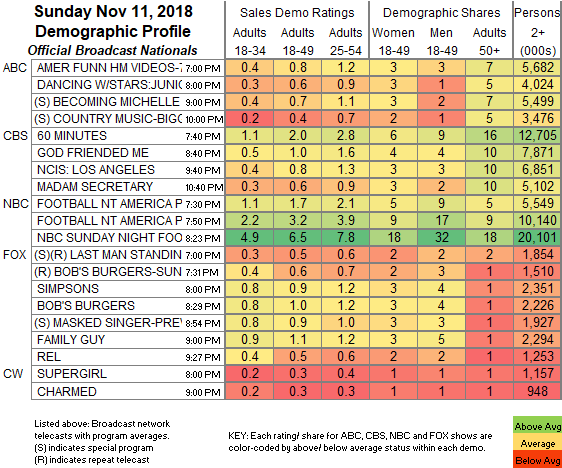 TLC’s 90 DAY FIANCE ticked up to 0.56, with an AFTER-SHOW at 0.42. Discovery’s ALASKA: THE LAST FRONTIER climbed 0.05 to 0.32. 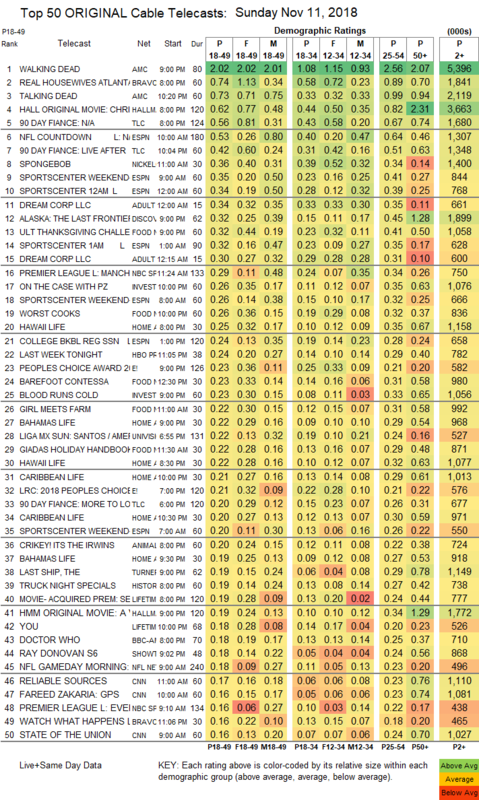 On Food Network, ULTIMATE THANKSGIVING CHALLENGE dropped 0.07 to 0.32, and WORST COOKS IN AMERICA returned at 0.26. NBC Sport’s PREMIER LEAGUE match was at 0.29. On ID, ON THE CASE gained 0.03 to 0.26, and BLOOD RUNS COLD was up 0.04 to 0.23. HGTV’s line-up was led by HAWAII LIFE at 0.25/0.22, compared to last week’s 0.24/0.22. History’s TRUCK NIGHT specials were at 0.19.